The system allows students` parents to monitor when their children reach the school and return home. 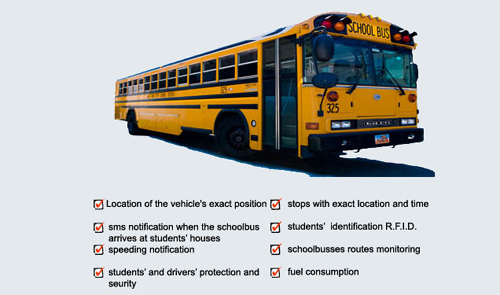 Speed violations can be verified at all times giving parents and shcoolboard members a safety confirmation. Optionally, when the transportation vehicle draws near home, an SMS is sent to the parent’s mobile phone and thus his/her unnecessarily waiting outdoors is prevented.